Double Elephant brand is the registered trade mark of Yuan Ho Xing, the name of the manufacturing company, which translates as origin of happiness. Although the cards are used in Singapore, they appear to be printed in Hong Kong. According to my great aunt (an expert on these matters) there used to be yet another sort of four-colour-cards, which were shorter and squatter than the ones I show you, and had ochre-red backs. Images kindly supplied by Anthony Lee of Singapore. 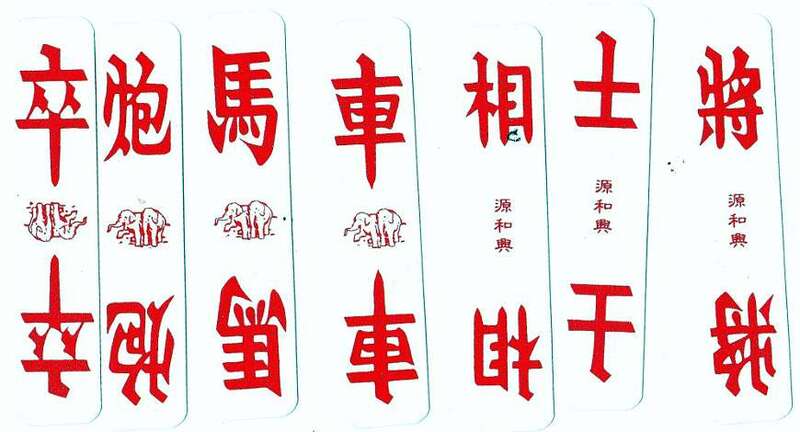 Above: Double Elephant brand Four Colour cards. The ranks are : 將- general, 士-advisor or valet, 相- elephant, * 車- chariot, 馬-horse or knight, 炮- cannon, 卒- soldier. * the character 相 taken literally means 'like.' Some sources translate this as 'minister.' By right, the character for elephant should be 象. The reason for this strange substitiution is that both characters sound much the same. Images kindly supplied by Anthony Lee of Singapore. As in the above deck, with the brand name “Double”, the Chinese reckon twos, and even numbers in general as lucky. 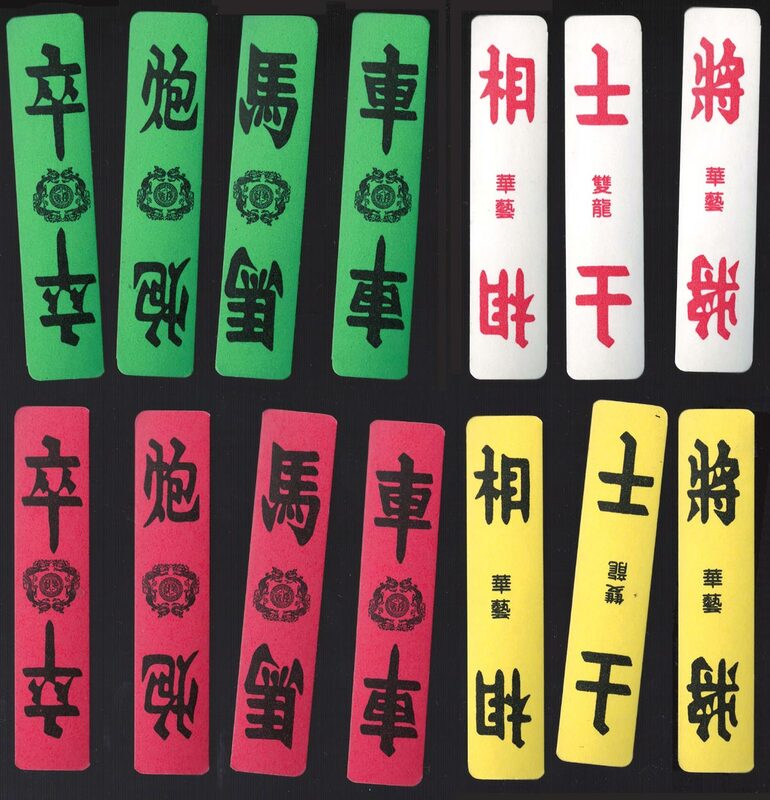 Above: “Double Dragon” four-colour cards by Hua Goi (華藝) Pte Ltd. These cards are are of the same pattern as those produced by the "Double Elephant" brand. 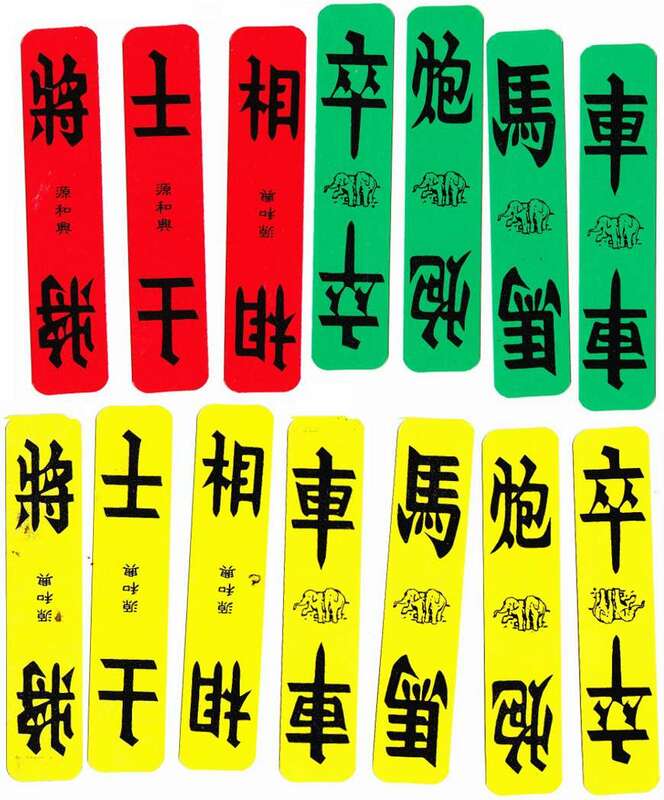 The Chinese call these the "Chaozhou four-colour cards" 潮州四色牌 . Both decks possess the same basic structure. There are four colours or suits. In each suit there are seven ranks, 将， 士， 相，車， 马 ，炮，& 卒. This basic unit of 28 cards is quadrupled, giving the full deck of 112 cards used for the game.